So, here we are with Mega Man 3, the third installment in the Mega Man series. By the time CAPCOM’s Mega Man 3 was released in 1990, it’s preceding installments had met with great success. In fact, Mega Man 2 is the top-selling game in the Mega Man franchise selling over 1.5 million copies in its lifetime. The game begins with Dr. Wiley unleashing his newest Robot Master creations on the world leaving it up to Dr. Light’s Mega Man to single-handedly foil Dr. Wiley’s scheme for the third time. The Robot Masters are quite interesting this time around with Mega Man facing Magnet Man, Needle Man, Shadow Man, Gemini Man, Spark Man, Hard Man, Top Man, and Snake Man. In Mega Man 2, there were the “item” additions which supplied the player with various abilities. In Mega Man 3, these functions are replaced by use of Rush, Mega Man’s robot-dog companion. Mega Man begins the game with the Rush Coil which transforms Rush into a spring-loaded platform from which Mega Man can bound high into the air from. Once Mega Man has defeated Needle Man, the Rush Jet ability becomes available and turns Rush into a rocket powered surf-board. 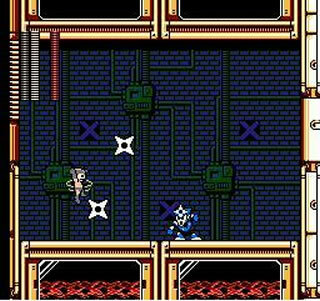 Defeating Shadow Man allows for the Rush Marine ability which converts Rush into a submersible vehicle for Mega Man to use in submerged areas. These abilities allow for very interesting game-play. Defeat the boss (in this case Shadow Man), and you will get the weapon used by them. The game-play of Mega Man is much the same as in the previous two installments. The player runs across the screen gunning down enemies with first the Arm Buster and, later, weapons learned from defeating the Robot Masters. 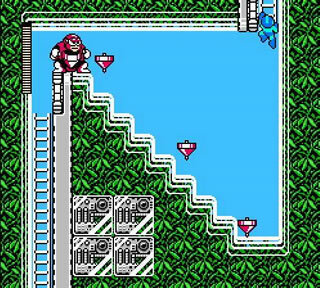 The greatest intrigue to the game-play of Mega Man 3 is the ability to approach obstacles in each stage differently. With the addition of the “Rush” abilities, the player is often given a choice when deciding how to approach an obstacle presented to them. They can use the Rush Jet to fly across or use the disappearing platforms. This allows players to approach obstacles differently and adds variation to the game-play. Mega Man 3’s arsenal of weapons has its pros and cons. Some weapons, like the Gemini Beam and the Magnet Missile, are extremely useful while others, like the Top Spin, rarely get used. The majority of the weapons are more utilitarian with only a few being useful more often. Even so, they are still fun to experiment with. As for the graphics and music, I’d have to say the graphics of Mega Man 3 were, once again, slightly improved over its predecessors though mostly unchanged. I found the musical tracks in Mega Man 3 to be quite catchy. While the Dr. Wiley stage music in Mega Man 2 is highly touted I’d have to say that, generally speaking, I prefer the overall soundtrack to Mega Man 3 over Mega Man 2. Overall, I highly recommend Mega Man 3 to anyone. While it can be quite difficult at times, the player can always overcome the difficulty with a bit of thinking and creativity. Mega Man 3 leaves many tools at the player’s disposal so there’s often more than one way to approach an obstacle. If you’re looking for a good, challenging, and all-around entertaining action platformer, Mega Man 3 is definitely a sound selection. Nice review, hope to see more from you in the future! Welcome to the garden. I can honestly say (with some embarrasment) that i never played any of the Mega Man games, despite being the owner of a NES when i was a child. I stumbled across this review and now i will seek out this game and play Mega Man (3) for the very first time!. Good review, concise and informative, thankyou.